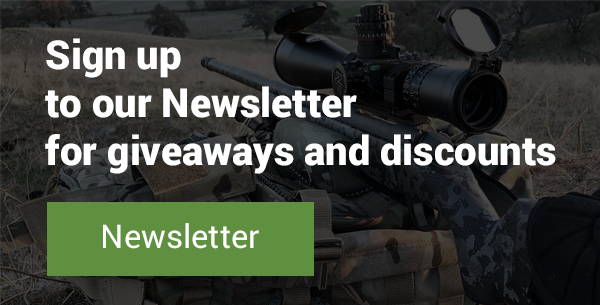 The scope offers several ways to compensate for environmental conditions and to get your rounds on target. "Dialing" the turrets changes the point of impact, but you can also make compensations using the right scope reticle. There are many differing types of reticles as we discussed in the Scope anatomy section. In this case, we need a BDC reticle design with hashmarks on both planes to allow for both windage and elevation. 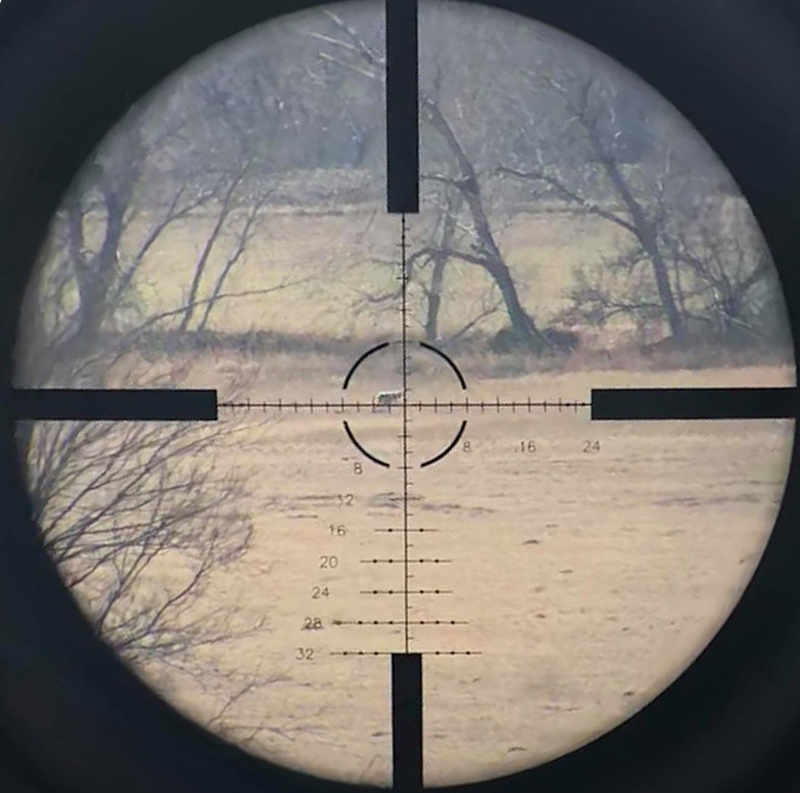 ‍Image credit: Mike Bird - Coyote at 680 yards. Bushnell Elite LRHS. The words windage and elevation relate to the amount of compensation for wind and bullet drop (holdover), or the amount we appear to aim (or hold) “over” the target with the rifle in order to get it to “drop” on the target. Long distance shooters tend to “dial for elevation” and “hold for wind,” or using scope turrets for the elevation adjustment, and using the reticle for the wind adjustment. The concept of using the reticle is the same, we are just changing the point of aim a certain number of increments based on the measuring system inside the scope reticle, i.e. MOA/MIL/distance, etc. Note: The hold is generally made the closest increment available in the reticle, and each design will have differing scales of increments. Using the reticle for any form of compensation is usually associated with speed. Instead of taking the time to use the turrets, the shooter simply makes a range or wind calculation, and then looks that the reticle and moves the point of aim a certain number of increments within the reticle design, then shoots using that new point in the reticle. The shooter is no longer using the very center of the scope, but is measuring a new point across the X/Y axis within the scope to get the shot on target. It's fast and accurate if done right. One restriction to consider is that the reticle itself can only offer you a certain amount of compensation change based on the magnification of the view. Looking at a reticle and the target fully zoomed in, you will only have a fixed amount of hashmark measurements to choose from. As the wind requires smaller increments versus the distance, that's why we generally dial the turrets for the elevation and use the reticle for the wind changes at long range. 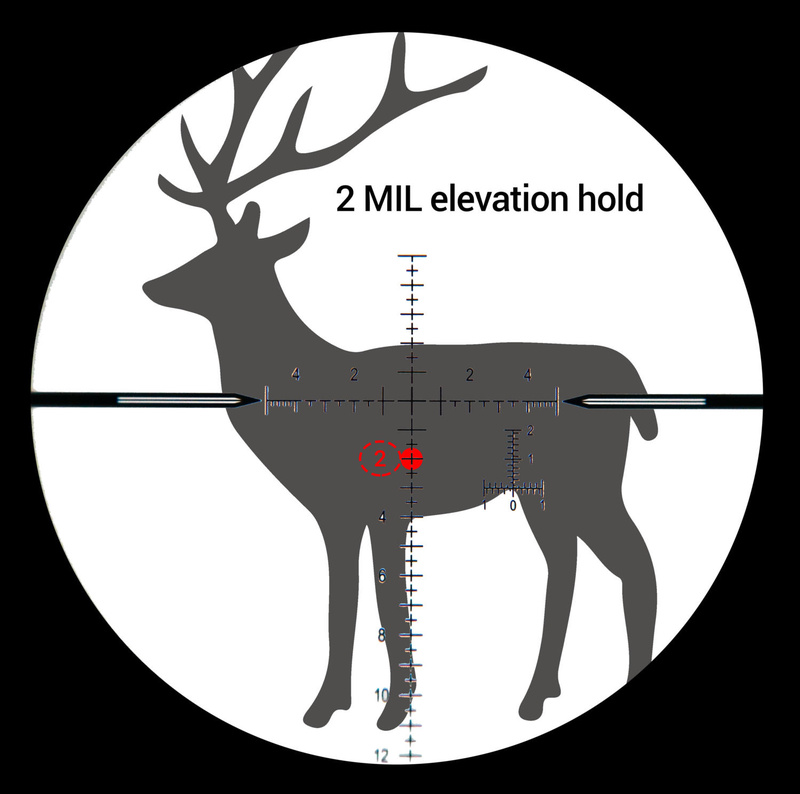 Holding for elevation adjustments uses the vertical scale in the reticle. The amount to “holdover” or up in the reticle (the center crosshairs are above the target) relates to the scale on the reticle, preferably a certain number of MOA or MILs. The same idea also applies to the “hold-under.” This is generally calculated using a rangefinder, but as we see below we can also use the reticle for range as well. Holding for elevation allows the shooter to engage a single target very quickly without having to take the time to dial the necessary elevation adjustment. This method is generally saved for a 2nd round shot after a miss versus the first shot, however, as we usually dial for elevation. 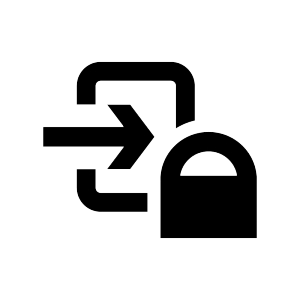 Holding over can also be a way to rapidly engage multiple targets. For example, by creating a list of elevation adjustments for each target to be engaged (DOPE chart), the shooter can quickly glance at the adjustment and holdover the appropriate amount within the reticle. For a quick follow up shot after a miss, the shooter can measure the distance of the miss by utilizing the information within the reticle and can make the corresponding hold adjustment. Holding for wind (windage) is much the same as the elevation, but it uses the horizontal scale and also uses miles per hour to translate to the change required, again best measured in MOA/MILs. Holding for wind is the natural use of the reticle due to it's constantly changing nature. When making the adjustment, remember to hold into the wind so if the wind is left to right, you will need to adjust to the left and into the oncoming wind direction. 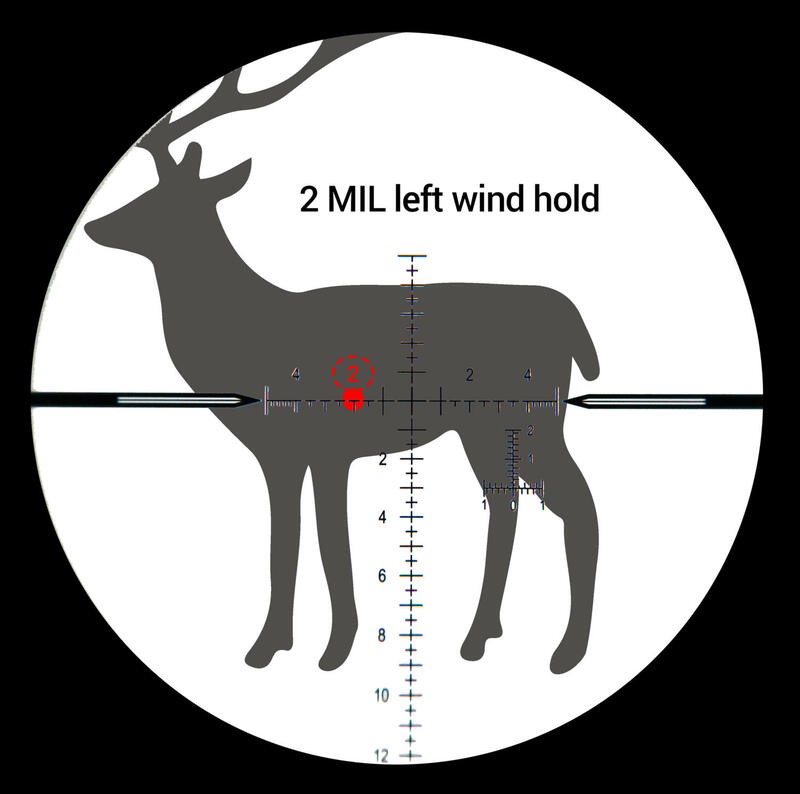 For example, if you have figured out that you need a half MIL hold left into the wind at a certain distance, you will position the target on that hashmark in the reticle and shoot. With the right scope reticle design, you can make super fast compensations without taking your head out of the rifle and your eyes off the target.